This is a salad I make often throughout the year for lunch, but I do make it much more frequently during the summer when I can pick sun ripened tomatoes and cucumbers right from my garden. My Greek salad simply contains tomatoes, cucumbers, and onions, along with a few pitted black olives, and a crumbling of reduced fat Feta cheese. I dress this salad with a simple vinaigrette of red wine vinegar, olive oil, dried oregano, salt and pepper. You can serve this salad on a bed of salad greens, or add some greens into the salad if you prefer. Without the greens, this salad actually packs well for picnics, though I would recommend mixing in the dressing just before you serve it. Though high in calories, black olives and Feta cheese are so flavorful that you do not need to add much to give the salad a burst of flavor. Reduced fat Feta is also available in many grocery stores and is a suitable replacement. Another option to add nutritional value to this salad would be to add some drained and rinsed canned chickpeas in with the vegetables. I’ve done this many times and it turns a simple Greek salad into an entire meal. The vegetables included in this easy Greek salad are low-calorie and nutrient-dense foods to include in your daily diet. Tomatoes are high in vitamin A & C, cucumbers are a healthy source of potassium, and red onion slices provide additional vitamin A and C, as well as a small amount of fiber. Choose either Gaeta or kalamata olives, each of which is a healthy source of unsaturated fat.It is thought that eating olives on a regular basis might may help lower your blood cholesterol and help neutralize free radicals that can lead to cancer and other chronic illnesses. Stick to four or five olives per salad though, because they are high in sodium. 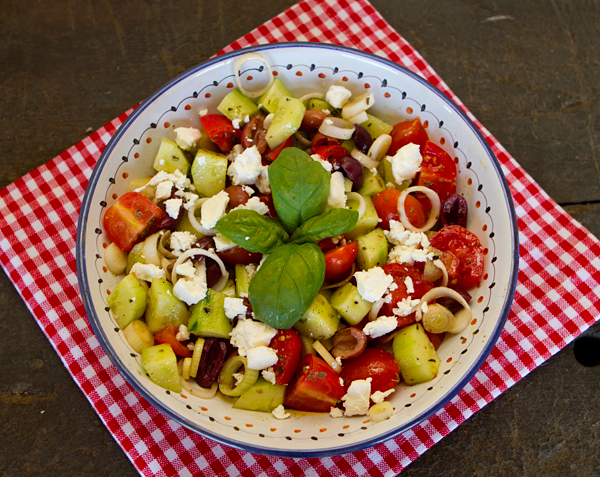 A small crumble of feta cheese adds a bold flavor to a Greek salad, but is also a nutritious topping. Use a moderate amount of cheese on your salad because while it is healthy, it also is fairly high in fat. Feta cheese will also supply you with calcium to support healthy bones and teeth, zinc and vitamin A, as well as a trace amounts of potassium, magnesium and B vitamins. A crunchy and delicious salad that is great year round. Mix together the vegetables in a large bowl and toss. In a separate bowl, whisk together the dressing ingredients, then add the dressing to the vegetables and toss. 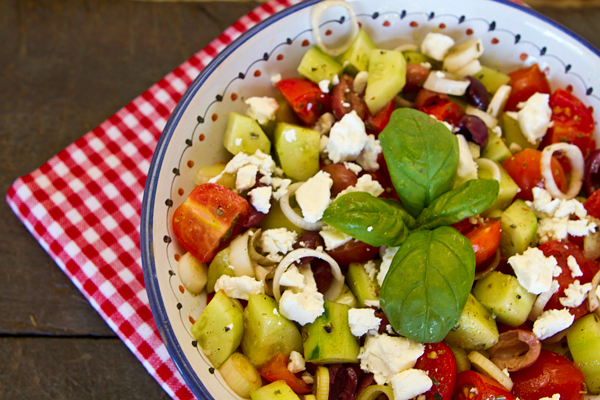 Break up the Feta and sprinkle on top of the salad with the olives and serve.